Comparing Cloth Diapers Mama Say What?! | Mama Say What?! 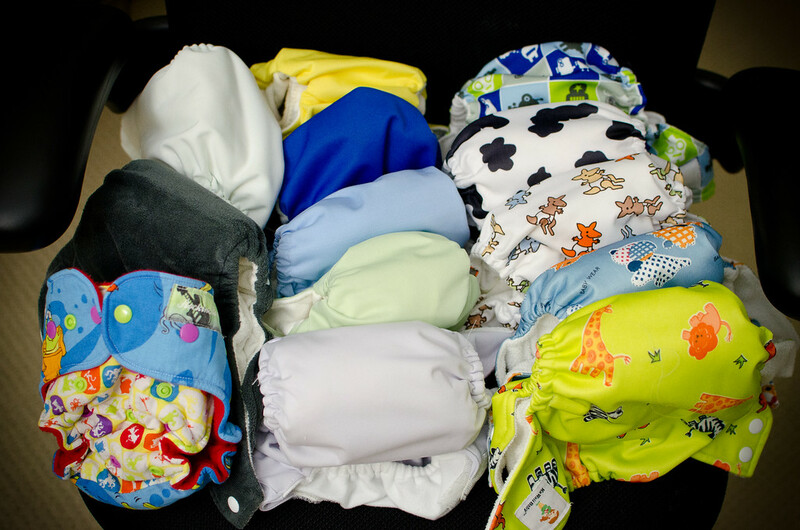 Every cloth diaper (CD) parent has their favorite brands and types of diaper, and they vary widely from person to person. My experience is that my preferences have changed over time because of the consistency of my son’s bowel movements, his activity level, urine volume and his size. A good example is that most parents will tell you that using a prefold and wrap is good for newborns, while pocket diapers are better for older infants and toddlers. So instead of doing a review of my absolute favorite diaper, I’d like to do a review across the span of time. I only used gDiapers during the first few months. I got a newborn rental package from Jillian’s Drawers and my engineer husband didn’t like any of the diapers’ “construction”. (Hmm, okay?) He did his own research and brought back a bag of gDiapers and showed me how he could stand them up on the table and they naturally contour into a nice round shape, unlike my diapers that would just flop flat. When your CD-hostile husband finds a diaper that he likes, what do you do? You nod, smile and praise him for his good find, and return your cloth diapers— no matter how cute they are! gDiapers are not the best-liked diapers in the cloth diaper community, but my husband and I liked them fine. It was a bit tricky to get the fit right so that it didn’t leak, but only took us a few days before mastering it. We used the flushable inserts most of the time. They come with a stirring stick to break up the inserts in the toilet. But the prospect of hanging the used, dripping wet stick on the toilet scared us. We quickly found out that we could simply tear the inserts into a few strips and they were flushed with no problems. We always flushed the inserts instead of tossing them in the trash, because in the landfill biodegradable items don’t degrade because of the lack of air and microorganisms in the landfill. Warning, though— flushing wastes a lot of water, and if you have a septic system, you can’t flush the inserts. 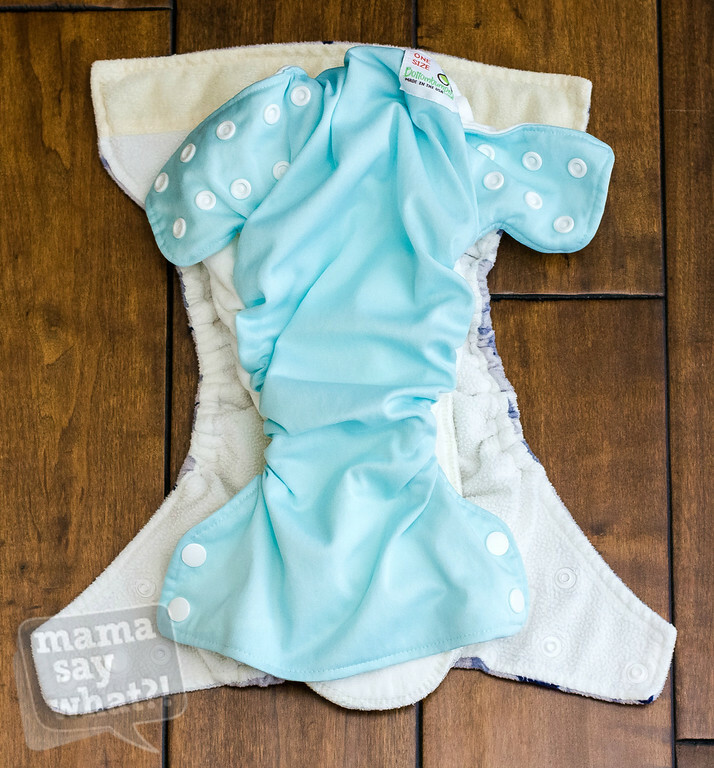 Although the flushable inserts were convenient and as absorbent as disposable diapers, gDiapers’ cloth inserts (gCloth) were not nearly as functional. 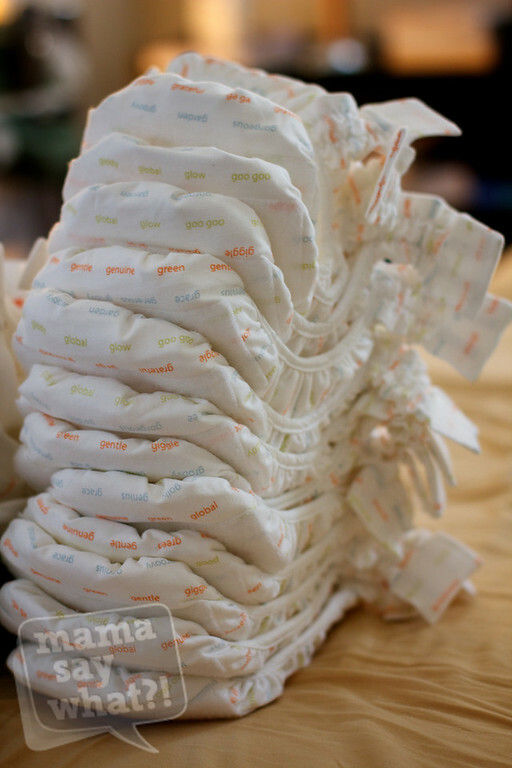 Even for a tiny newborn, one gCloth is not enough to absorb everything within a two-hour period. If you plan to cloth diaper full time with gCloth, then the cost quickly adds up since we needed twice as many inserts as gDiaper recommends. I found a great and cheaper alternative to gCloth though. Nappy Shoppe (an American work-at-home-mom) makes g-Flappers, layers of absorbent materials sewn at one end for easy washing. She offers many materials, such as bamboo and hemp. Her best known and most popular one is all-bamboo. They are so much more absorbent than gCloth, and the price is better compared with two gCloths. The best thing about g-Flappers is that you can use them in any pocket diaper. Fit: They are sized diapers, so they fit better than one-sized diapers. They contour well to the booty. They are very trim. Leak: The inserts tend to bunch in the middle, but doesn’t seem to cause leaking. If worn correctly, it only leaks occasionally, but does take a few days to figure out the proper fit. I don’t find it leaking more than other two-in-one/all-in-one diapers. Absorbency: Flushable inserts are as great as disposables; Cloth inserts are poor, need to double up and still not very absorbent. But NappyShoppe gFlappers’ absorbency is excellent. As our baby ate more and got bigger, the gDiaper started to leak more and more. Besides, I wasn’t comfortable with all of the water consumption. This was when I ventured out to other types of diapers. Kawaii diapers are my absolute favorite diaper across all stages! They are built similarly to BumGenius, but at a fraction of the price. They come with all sorts of cute colors and patterns, they have the option of snaps or Velcro and you can buy them made of bamboo or cotton. The bamboo inserts are very thin and much more absorbent, so I buy extra sets of them even if I don’t get the regular cotton diapers. Their diapers are big, which are great for older babies and toddlers, but I can imagine them not fitting so well on newborns and small infants. However, they do have diapers for newborn that fit up to 15 lbs, and I plan to use them for my next baby. I have both snap and Velcro closure types. Their Velcro is great, even better than BumGenius’ in my opinion. The bond is strong and extremely durable. I machine-wash, machine-dry, and after a year and half, the Velcro’s condition is still as good as new. Their snaps are generally good too, but I did have a batch of diapers that the snaps were extremely hard to close. I don’t see anybody else reporting this problem online, so it’s probably just a bad batch. With the price this cheap, I don’t mind occasional lemons. Now that my son is almost two, we’re using Kawaii almost exclusively as other brands can’t keep up anymore. The pocket opening is big enough for easy stuffing, and inserts usually just fall out during washes. But the opening is not so big that poops get inside the pocket, which is a problem in Rumparooz for us. The lining material, both cotton and bamboo, are very easy to rinse. Even poopy diapers, after sitting in the daycare for a whole day, can be easily rinsed off at night. Another thing I really like about Kawaii is its selection of patterns and colors. They come in much wider variety than BumGenius and are updated every few months. Fit: Both snaps and Velcros fit well, and all styles fit similarly. They are pretty large and can fit toddlers well. Not particularly trim but not bulkier than other pocket diapers. Leak: Rarely leak, holds blowout well. Absorbency: Great, especially bamboo inserts. Overnight diapers are very reliable. We used one insert during the day and two at night before my son was about a year and a half, and added to two inserts (one bamboo and one microfiber) and three bamboo inserts at night when he became a heavy wetter. We can easily go three hours between changes without any problems. BumGenius is very similar to Kawaii, except that it’s pricier. The Velcro tabs curled up after a year and half of machine washing and drying, but doesn’t affect its performance. However, it is easier to hook onto other diapers in the washer. Their washing instructions say to line dry the cover, but I always machine dry everything and don’t have any other problem beside the curled up Velcro. Their lining is suedecloth, which feels very soft and smooth in the hand. Although they feel great, depending on the poop consistency, I find them slightly harder to rinse as there is too much friction between the poop and the lining. And many babies are allergic to suedecloth, so you may want to get one and test for allergy before committing. Fit: They are pretty large and can fit toddlers well. Not particularly trim but not bulkier than other pocket diapers. Their material is stretchier than Kawaii so fits more smoothly than Kawaii. Absorbency: N/A. I only bought the cover and use Kawaii inserts instead. But since BumGenius only offers cotton inserts, its absorbency is as good as cotton. What separates Rumparooz from other cloth diapers is its double inner gusset design. The inner gusset is like a little wall along the side of the diaper, and is a great protection against liquidy poop or blow-outs. I really appreciated it when my son was first introduced to solid food. When a baby’s major diet source is still breastmilk or formula, but mixed with a little solid food, their poop consistency can be similar to diarrhea and can be very easy to leak. They tend to leak from the back for disposables, or from the side inside the legs for cloth diapers. Rumparooz is pricey, but the price is reflected in the quality. It is well constructed, and its designs are adorable. I hesitated getting these because many mommies complain that its waistline is too low, especially bad for boys, and that it runs small. I personally didn’t find that to be a problem, but my son is lighter and shorter than average. If you have a larger baby, it may not fit for too long. However, once our son’s poop solidified better and became more clay-like, the double inner gusset became a liability. Sticky poop got stuck in the ruffled gusset and I had to expand the gusset to rinse thoroughly. Doesn’t sound too difficult? Imagine again, expand the side of a poopy diaper with ONE hand, while the other holds the spray. It’s hard not to get poop all over your hand. Once our son was about 16 months old, there were two new problems with Rumparooz so we had to stop using them. One problem is that Rumparooz’s pocket opening is generous for easy stuffing. It was not a problem until our son was big enough that his poop extended all the way up to the back, dangerously close to the edge of the diaper, closer than other brands because Rumparooz runs small. The combination of that and a big, loose opening means that when I rinse the diaper, the poop gets washed into the pocket. Once it’s inside, it is close to impossible to rinse it back out, so I have to use toilet paper and my hands to dig it out. It gets so messy and disgusting with a dripping wet and soiled diaper, even too much for a cloth diapering mama to handle. The absorbency proved to be a problem around the same time. Although I started using the doubler around 15 months, they were still not enough, and my son easily soaked through the diaper. Rumparooz has hemp or bamboo inserts for an extra cost, and they should be better for heavy wetters, although I have no personal experience. Despite these things, it was my favorite diaper for a good year. I always changed him into a Rumparooz for doctor’s appointments. Besides, from talking to other moms, I feel like my son’s poop is stickier than others, so my problem might be unique. The common complaints about Rumparooz are its size and its price. Fit: Runs small. Low waistline. Leak: Side leak protection is superb, especially for blow-outs. Absorbency: Microfiber inserts are fine for light wetters. Heavy wetters should consider hemp and bamboo inserts ($10 and $12 respectively). Bottombumpers is an all-in-one (or two-in-one by some) diaper. All-in-one diapers (inserts snapped onto the cover) are generally trimmer, and side-snapped diapers are trimmer than center-snapped diapers. Bottombumpers is a happy marriage of all-in-one and side snapping, so it’s the trimmest cloth diaper out there. The drawback of an all-in-one is they’re not as leak-proof as pocket diapers, since the inserts tend to move around or bunch up. My favorite thing about Bottombumpers, other than how trim it is, is that there are no inserts to remove and no pocket to stuff. Every time I tossed the whole diaper into the diaper bin, I smiled from ear to ear. I know it’s just a few seconds of time saved, but somehow it can feel like a mini vacation. During my son’s first year, when we were at home I always reached for Bottombumpers first but I never used it when we went out because it needed to be changed within two hours or it’s guaranteed to leak. I was so in love with Bottombumpers I would’ve replaced my whole stash with them if they were easier to use. You have to make sure the insert is straight and flat, and you also have to tuck in any white interior part or else it’ll wick onto the clothes. I explained to my husband ten times but he never understood it, so I didn’t expand my Bottombumpers stash. I’m glad I didn’t though, because once my son was a year old and became a heavier wetter, Bottombumpers could not keep up with his volume. They only come with one type of insert, which is cotton. Like BumGenius, they don’t have a more absorbent option like bamboo or hemp, which I found necessary for heavy wetters. Fit: Extremely trim and fit smoothly. The waistline is pretty high, especially great for boys. Leak: Easy to leak from the side, a common problem of all-in-one diapers. Absorbency: Not very absorbent. Good for younger infants. We stopped using Bottombumpers shortly after he turned one because it wasn’t absorbent enough. A few months later we stopped using Rumparooz as well because the poop usually got into the pocket which was such a pain to rinse. We’re continuing to use Kawaii and BumGenius and pretty sure we can continue using them until my son is potty trained. Kissaluvs Cloth Diapers Review and Giveaway! Added by Rebecca S. on September 5, 2012. Great info! I think I’ll be trying out the Kawaii diapers! Thanks for the info! I’m just looking into cloth diapering for my two kids, and while I’m on board my husband is not. I’m doing my best to convince him though! Thanks for your posts. I’m on the verge of making the CD plunge. Have you tried Sunbaby diapers? They seems similar to Kawaii. I love reading diaper comparisons and getting a feel for different brands through others’ experiences! What works for one family might not work for another. And my husband loves pretty much any cover with a trifolded prefold, so I have plenty of those at the ready.